Sunshading is a crucial element of urban design, especially in sunny Australia. While some might view sunshades as a bland utility feature, this is no longer the case. Innovative engineers have worked to ensure that sunshades are not only more effective than ever, but also more aesthetically pleasing than ever. When we think of sunshades, we typically imagine a solution that will completely (or almost completely) block out the light. However, in an urban design scenario that includes commercial spaces and outdoor green spaces, it can actually be more useful to have a solution that redirects and controls light. A good example of this is Sydney’s One Central Park development. 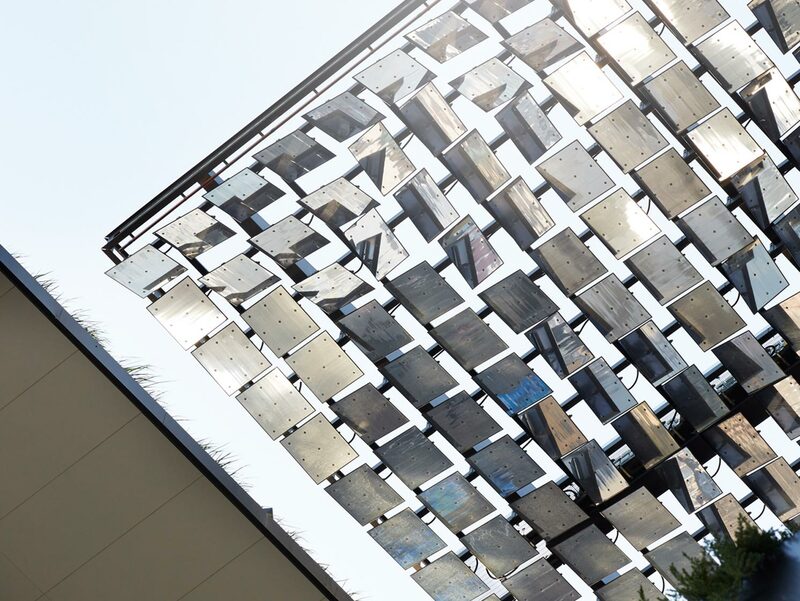 Not only is it an example of pioneering sustainable architecture, but it also includes a stunning and highly functional shading solution using Tilt’s Heliostat Reflector Technology. The shade structure uses a combination of motorised and fixed mirror arrays to reflect sunlight throughout the site to offset the impact of overshadowing caused by the two towers. The reflections deliver substantial natural light into the retail space below, with the balance of light distributed to the shared spaces and parklands surrounding the site. No matter what time of day, as long as the sun is shining the system can deliver controlled amounts of sunlight to these key areas, improving liveability for residents and visitors to the site. One Central Park is the world’s largest installation of heliostats in an urban environment and the most significant use of this technology to ameliorate overshadowing of a public space by buildings. Melbourne’s iconic Stokehouse restaurant is a sophisticated, contemporary example of sun control. After a severe fire in 2014, the owner sought a rebuild that would retain the character of the building, while also making it environmentally-friendly. As part of this, Tilt was asked to design, manufacture and install its operable architecture bi-folding screens on the restaurant’s exterior. The screens sit outside of the restaurant’s windows and provide protection from the sun, but can also be raised to highlight beautiful ocean views. This way, the character of the building remains unchanged while patrons’ comfort is much improved. “Access to sunlight and fresh air are critical outcomes for realising successful developments, particularly in the public space,” says Tim Philips, managing director of Tilt Industrial Design. There’s no doubt that a lack of shade can have a negative impact on human health, especially in a country where temperatures can reach over 40 degrees Celsius in the summer. This can become a big problem for older people, who are more vulnerable to the heat. A retirement home in Narrabeen, NSW had this exact problem when one of their glass-lined lift shafts was found to have temperatures exceeding 50 degrees Celsius in the summer. The building’s original design had not accounted for the internal heating of the glass, which was an external feature around the lift lobby of the building. Overheating of the lift shaft caused management to abandon use of the lift in summer due to the personal welfare of the tenants and mechanical operational issues due to the material heat mass. As a result, low mobility tenants were confined to the ground floor levels. In this case, the architect chose to use fixed horizontal shading louvres from Greene Fire. A sun study showed that the design of the 200mm-long louvres spaced 130mm apart would provide adequate shading after 11am during the hottest months of the year. The architect used Greene Fire’s Microlouvre, which is a versatile mesh product that can be used for a range of applications. Originally developed as a solar shading screen, it has also been used as a fire attenuation screen, bushfire screen, light diffuser, privacy screen, insect screen and has even been used in model-building for Star Wars tie fighters. The mesh is made from miniature woven bronze louvres which are only two times thicker than a human hair, and are angled for optimum sun control, glare and light. The product allows 35 percent shading as soon as the sun comes over the horizon. The material is also specifically designed to absorb solar radiation at up to 92 percent, making it a good heat sink when installed external to the building. At the retirement home, it resulted in up to an 86 percent reduction in solar heat gain through the glass windows, making the lift safe to operate year-round.